Look at the box the spaghetti came in for directions on how to cook it and follow those directions. While the spaghetti is cooking, make up the sauce: Take a large bowl out and add the broth and sugar to it, whisking it until the sugar’s dissolved. Now add in the following ingredients, stirring to combine: soy sauce, vinegar, garlic, ginger, chile-garlic sauce, sesame oil and the black pepper. Leave the sauce off to the side for now. Take a large skillet and pour one tablespoon of the olive oil into it, setting the heat to medium-high. Once the oil’s hot, add half of the cubed tofu in and cook it for 5 minutes or until it’s crispy, turning the tofu frequently so all sides can get crispy. Place the crispy tofu on a paper towel-lined plate and repeat the process with the second half of the tofu*. Using the same skillet that you used for the tofu, pour the other tablespoon of oil in, keeping the heat at medium-high. Once the oil’s hot, toss in the onion and carrot slices, letting it cook for 2 minutes, stirring frequently. Add the mushrooms and green beans in, stirring frequently for 2 minutes**. Take the arrowroot mixture and stir it into the sauce to combine. Pour the sauce mixture into the skillet, letting it get heated up. Let the sauce bubble and thicken for 1 to 2 minutes (as soon as we saw it bubbling we moved onto the next part). Add the noodles and tofu into the skillet, tossing to coat in the sauce. Divide the skillet mixture among 4 plates or bowls and garnish with the cilantro, lime wedges and sesame seeds. *By the time we were done crisping the first half of tofu up, it seemed as if the tofu had absorbed all the oil so we added another tablespoon of oil in before crisping up the second half of the tofu. **By the 2 minute mark for the mushrooms and green beans, all the vegetables still seemed really raw so we put a lid on the skillet and cooked it for about another 6 minutes, taking the lid off just long enough to stir occasionally during that time. This recipe is going into our favorites if no other reason than for that sauce ! The sauce is delicious but that deliciousness gets muted somewhat once it’s tossed with all the other components. The lime juice and cilantro bring more great flavor to the dish though. 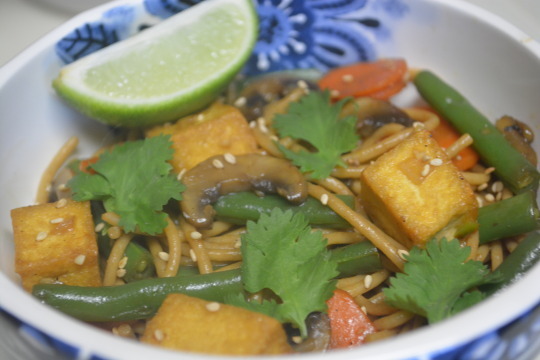 If you make this a day before you plan on actually eating it, the dish kind of takes on a vegetable lo mein feel by sitting in the fridge overnight which was awesome ! This recipe came from Clean Eating magazine. We weren’t paid in any form to promote Clean Eating.